Tiny Little Cayman, only 10 square miles in size and with a permanent population of about 150, is nonetheless home to a high-caliber cooking competition that draws chefs from far and wide. 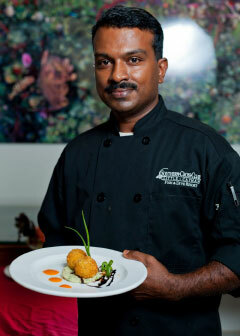 Chef Anu of the Southern Cross Club will be competing in the Sister Islands Cook-off on 14 November. This year, the 18th annual Sister Islands Cook-off takes place on Saturday, Nov. 14 at the Southern Cross Club. The event is the Sister Islands Tourism Association’s annual culinary fundraiser, A highlight of the winter season on Little Cayman, it has helped establish the island as a Caribbean foodie destination. The cooking competition is the focus of the event and offers five categories; four professional (soup/salad, appetizer, entrée and dessert) and one local. Chef Vidyadhara Shetty, owner of Blue Cilantro restaurant in Grand Cayman and the head of the Cayman Culinary Society, will lead the team of judges that will include Chef Frederic Morineau from The Ritz-Carlton, Grand Cayman and Chef Keith Griffin from the Cayman Islands Culinary Society. The bar opens at 4 p.m. and tasting tickets sold only at the event give attendees the chance to sample the contest entries, and the raffle prizes are always a big draw as well, say organizers. Live music will be provided by Grand Cayman’s Wild Knights. For more information, contact Southern Cross Club on 948-1099.